On Wednesday, 5 October 2016, I did a blog on a moth that I was not able to identify at the time. 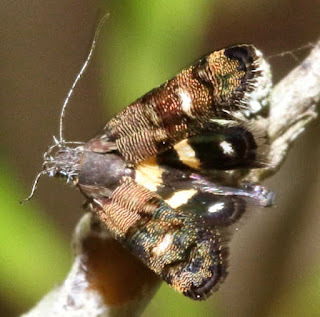 A kind reader has been able to identify the moth as Petalanthes hexastera which is in subfamily OECOPHORINAE, family OECOPHORIDAE. Unfortunately I was not able to find any information on its biology or its larval food plants. The wing span is quoted as being anything from 6mm to 10mm. I think my version was somewhere between those sizes closer to 8mm. It was a fast flier and hard to photograph. Some of the photographs with wings folded were taken in an "aquarium" which consists of two lens filters screwed together. This is a useful tool and allows me to get a photo and then release the moth. We have one moth here that is able to actually fly in that restricted space (see the next entry below). Thanks to Nick, who has some great photos on "Flickr" under the name "Dustaway". As I said above, these moths are tiny. They are breeding on a grafted Brachychiton Sp. ormeau in our yard and in spring they form brilliant clouds of golden moths in the early morning sunlight as they go through their mating dance. The larvae may be responsible for destroying the leaves on the tree, leaving the leaves brown and curled or they may only be after the honeydew. 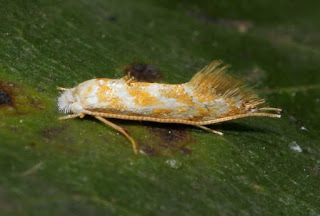 The tree is often also infested with thrips and leaf hoppers and a number of other insects. The tree eventually drops its old leaves and produces a whole new lot of leaves. See also the blog Wednesday, 30 September 2015 on the insects in this Brachychiton tree. I am an amateur photographer with an interest in entomology in particular moths and butterflies. The "About" page describes the range of this blog. Please read the "About" page for a description of this blog. Also please note that although I make every attempt to get the identification correct it is inevitable that there will be some errors. Obviously you will have to remove the NO SPAM.